"(...) There are mystically in our faces certain characters which carry in them the motto of our souls (...)"
On August 31, 2014 in Brusciano took place the annual "Festa dei Gigli" (lilies party). 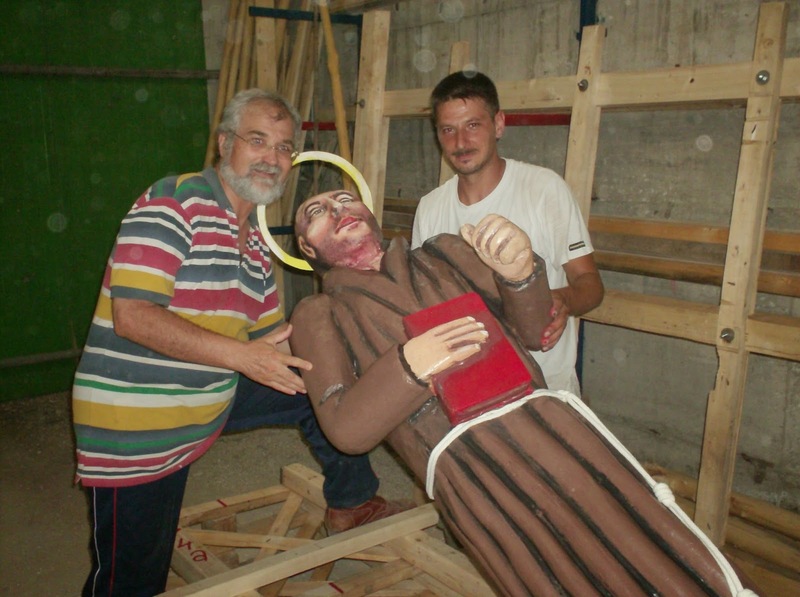 The protagonist of this celebration, even though we are in Campania, is St. Anthony of Padua. The devotion to this Saint is so strong in the town that the party in his honor is felt by people as more important than the country's patron saint, San Sebastian. 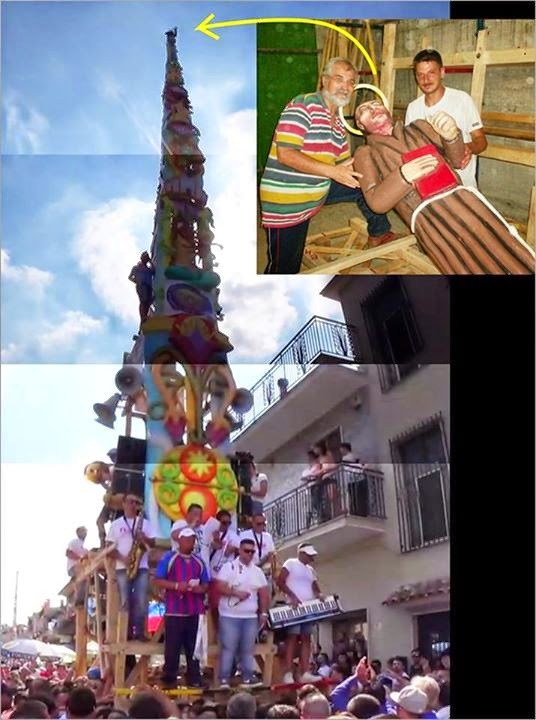 This year's celebration, however, was characterized by an important novelty: one of "Gigli" (Italian for lilies) dedicated to the saint, the "Giglio" of Passo Veloce, led at its peak the effigy of St. Anthony of Padua with its true face. The "Gigli" are constructions made ​​of poplar, fir and chestnut, in the shape of an obelisk, up to 25 meters and weighing till 50 tons, assembled with nails and rope and decorated with religious scenes. 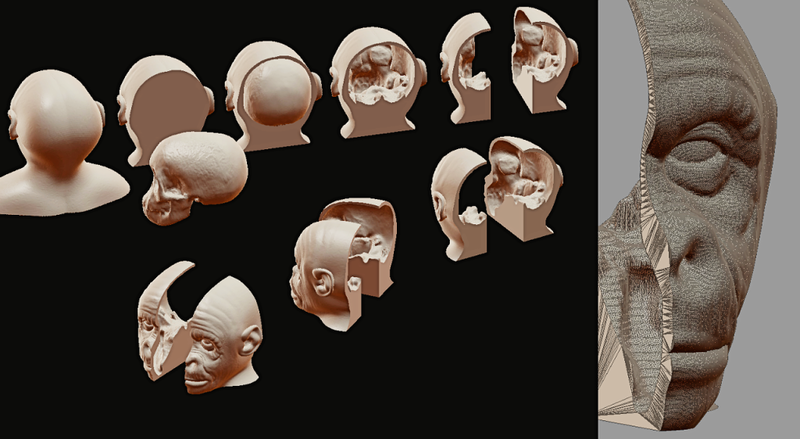 The forensic reconstruction of the face of the saint was a team work that has involved, among other institutions, the Museum of Anthropology of the University of Padova (Dr. Nicola Carrara), Arc-Team (Cicero Moraes and Luca Bezzi), the Centro Studi Antoniani (Father Luciano Bertazzo) and Antrocom Onlus (Dr. Moreno Tiziani) and was presented in Padua during the Antonian June 2014. The choice of the devotees of Brusciano is an opportunity of interesting considerations from the point of view of anthropology of religion, which gives us an overview of the relationship that believers have with Italian patron saints. The cult of the saints is in fact one of the strongest aspects of religiosity in Italy, being a powerful medium of identity. The Saints are not only representing themselves and their figures are not limited to a religious or hagiographical matter: each saint is primarily a sample of the community which he represents; he is a civic emblem that embodies the character of the city in which he is revered, of the community or the group who elected him as a patron saint and turned him into a "supernatural logo", as well summarized by the anthropologist Marino Niola. He is a sort of totem, which can inform us about the origin of customs, symbols, characters, and rules of conduct, involving the unique relationship that the saint has with that particular community in that particular area. It is no coincidence that the day dedicated to the local saint is a festivity day. One day that departs from the others through a series of behaviors which are different from those in use in everyday life: eating differently, dressing differently, following different rhythms given by the holiday. We have also to consider that, according to popular physiognomy, there is a correlation between physical features (especially facial), and character traits. The face of St. Anthony, given by the forensic reconstruction of Cicero Moraes, validates the folk imagery of the devotees. In this way the day dedicated to St. Anthony of Padua becomes a ritual representation of the city's tradition, a sacralization of the urban space and an opportunity to rewrite the "identity maps", to rebuild the community in the name of the saint. Here is how to explain the choice of the believers to use the true face of the saint: the symbolic efficiency of the saint is reinforced by his real look, which embraces the whole community gathered in celebration. In the video below it is possible to see the "Giglio Passo Veloce" with the statue of St. Athony on his peak (Standard YouTube License by Alessio Italo Jr. d'Alise). In this image you can see the statue of the saint, done by the sculptor Giacomo D'Alterio and painted by the painter Ilaria Auriemma for the Giglio Passo Veloce of the maker Gerardo Di Palma (photo by Antonio Castaldo). And here is a panoramic image of the "giglio", done by +Cícero Moraes withe the frame of the video. 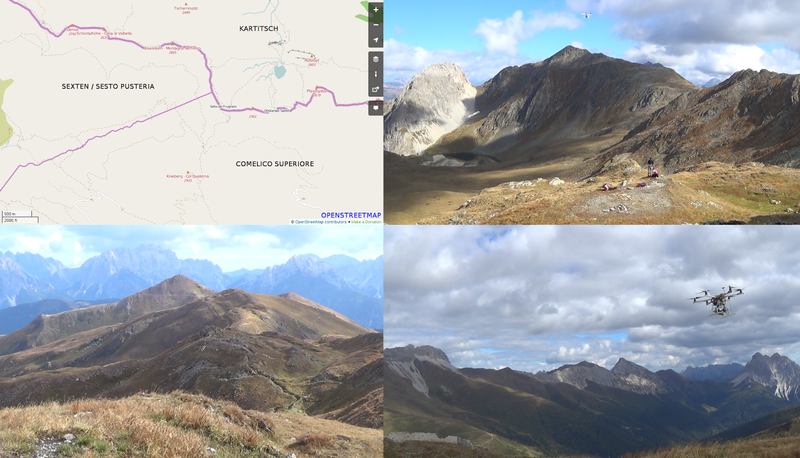 in the first days of October 2014, after a rainy summer, we have been engaged in taking aerial pictures and videos of the WW1 trenches in the border between Austria and Italy (villages of Kartitsch, Sexten/Sesto Pusteria and Comelico Superiore). The work was insert into a survey project financed by INTERREG funds. The trenches and military structures in the area of the project were mapped using a GPS (Trimble 5700); the most important and better preserved buildings were documented using different software (PPT, MicMac and OpenMVG) and particular hardware (aerial drone). Thanks to Walter Gilli, our "flight instructor and drone developer", we have a new hexacopter that you can see in the picture below. The video below shows the hexacopter flying in windy conditions. 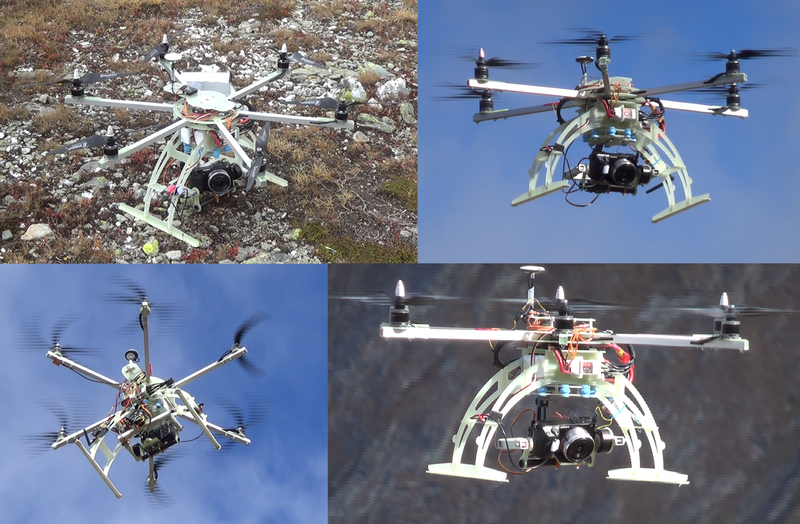 The high quality of the components makes this hexacopter a perfect instrument even in extreme situation. The video below shows the a flight in optimal condition: a cloudy day without wind. The gimbal stabilizes the camera even during movements, ensuring a high quality result. I always read in 3D modeling websites that Boolean operations were not things that should be part of everyday life for an artist involved with that environment. Besides generating meshes polluted, not always the command works. It just to put a slightly more complex model in the scene for the algorithm to crash or even have an outcome far, far away from the expected. Blender, as presented above has a modifier where we can apply Boolean operations, but these operations (although the algorithm shows improvement with each release) lie very far from ideal when we speak of the fields of action above. 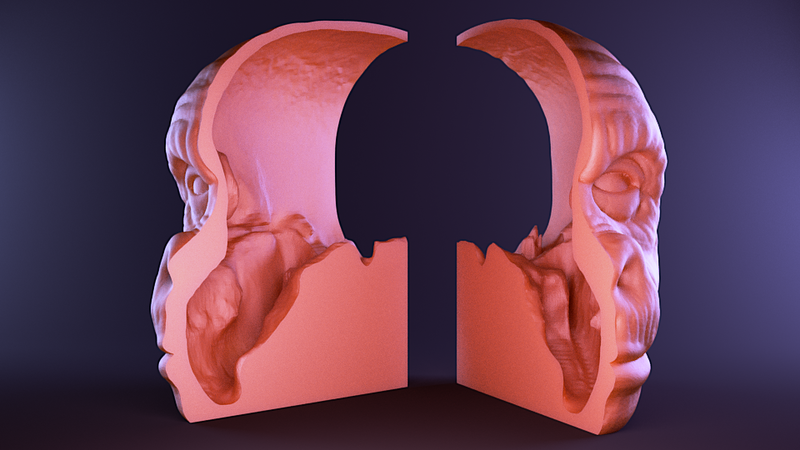 I suffered a lot when I started teaching classes for students who wish to apply Blender studies in medicine, dentistry, research-oriented human locomotion and prosthesis manufacturing. Everything worked fine, but when we began to enter the area involving the subtraction of a mesh by another ... ah my friends! I assure you that my hair was subtracted before, when they fell because of my concerns, because I never knew the surprise that the Boolean modifier was preparing us. Things got really tense when I needed to cut bones with spongy tissue. Besides being a heavy mesh had all the complexity of "an object inside the other," a deadly reality for subtraction of meshes. It was then that I thought a bit, Blender uses a library called CARVE to effect these operations ... then surely there should be alternatives, although they were more verbose in order to manipulate them. Reading a bit, I found a comment from the creator of CloudCompare, a fantastic comparison tool meshes. In this post he quoted a library called Cork, claiming to be interested in adapting it to the software code developed by him. I entered the Cork's site, downloaded the library and compiled it. For those who were fearful diantes the words "compile", can be carefree because the process is quite simple, just take the GCC, the Clang 3.1+ library and the GMP library (GNU Multi-precision arithmetic library), which are easily installable via apt-get (tested on Ubuntu and soon I will have to compile for Windows and Mac). Within the directory "samples" comes in two files OFF (Object File Format) format for you to test the software, which works on the command line and is very easy to be used. 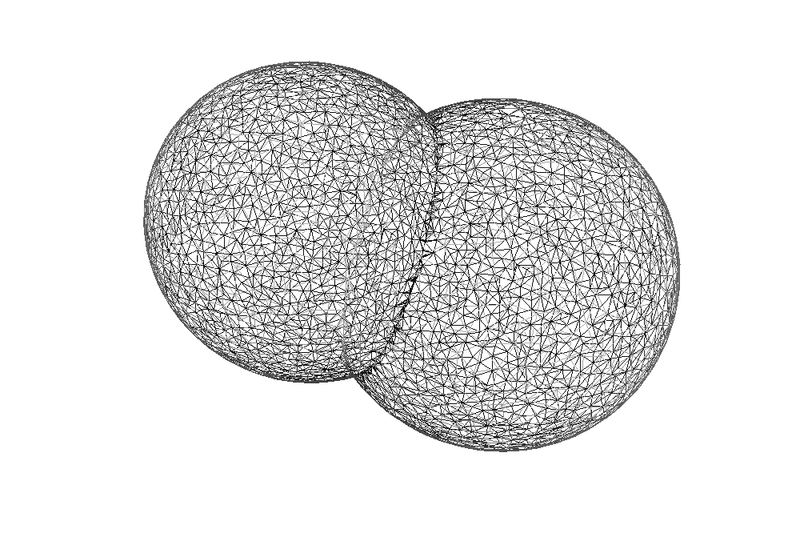 The files are two spheres, the ballA.off (right) and ballB.off (left). After compiling the program, please refer to the executable, or if you're lazy like me, just copy the files into the just ~/bin (not the system, of course) where is the executable. Where "-isct" is the type of intended operation and ballINT.off the output file. Needless to say, the $ should not be entered because it serves only to inform that it is the terminal. Above we have the difference operation, where we subtract the ballB of ballB. The "-diff" comes from difference. You can order files and reverse (A and B) to produce a different result. Taking the opportunity, it is common that individuals are initiating boolean studies do not understand the difference, for example, the two spheres (first image showing both mesh), a slightly within the other and a mesh created by union (picture above). Basically the difference is that with the "union" we have a clean mesh, with nothing inside their domains than an empty space. Examples of spheres was used solely for explanation of the operation of Cork. If you need to do simple operations and to manipulate objects in real time ... since they are simple ... 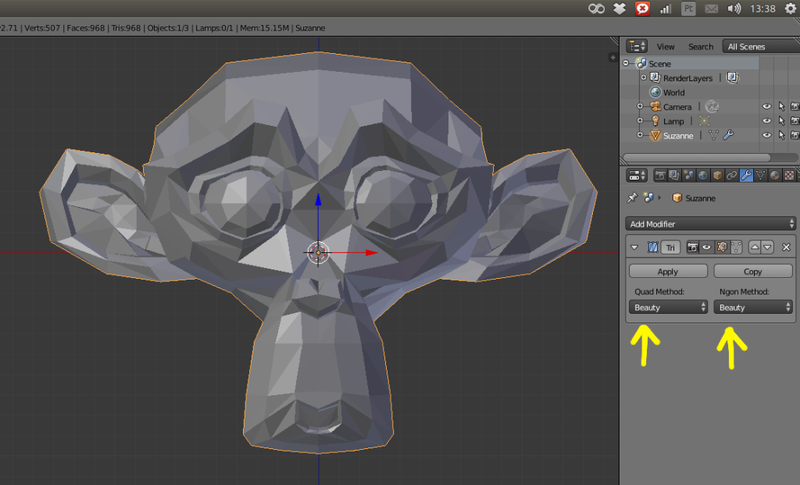 I advise you to use Blender. The Cork must be activated in case of using complex meshes, like illustrated the top of the post. 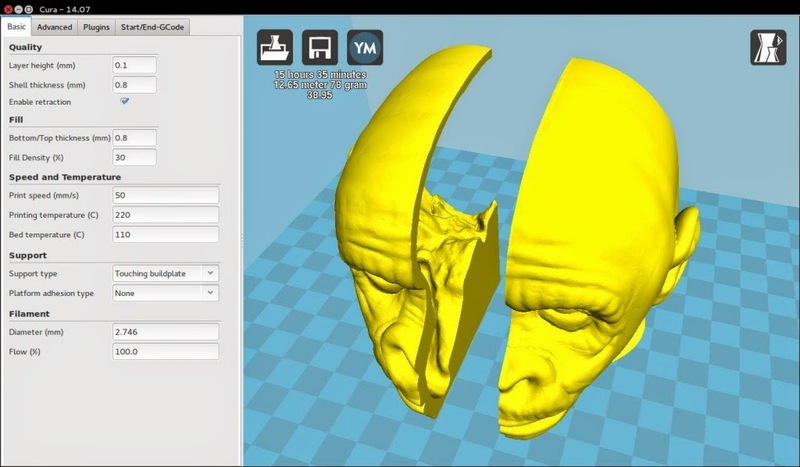 See above how the operations based on the face and the skull of a hominid were made. 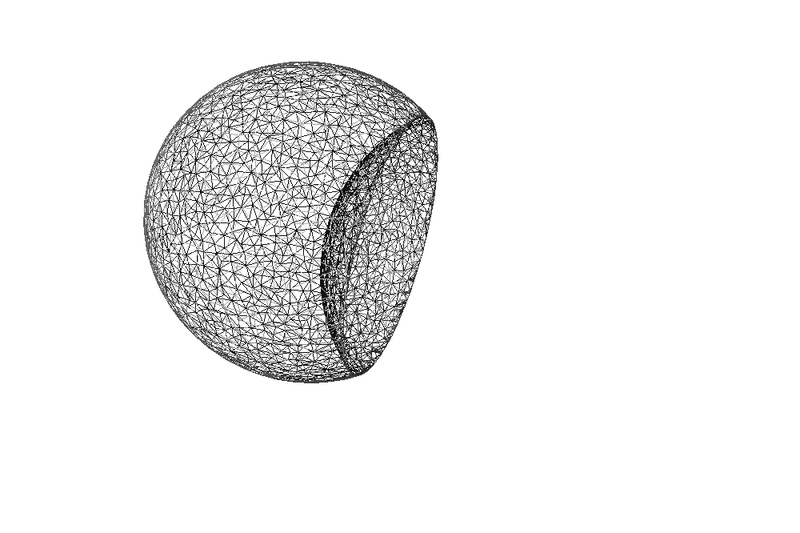 See how the right plot of the mesh is dense ... it's almost a miracle that the boolean has worked so well! To make this "miracle" however, you need to export the file in OFF format because the Cork only works with him. If by default Blender does not provide this exporter, the problem can be solved quickly by downloading an add-on created for this purpose. Before exporting the mesh, please change to edit mode and activate the Triangulate faces through the Ctrl + T command, this will ensure the functioning of operations, since the Cork only works with meshes formed by these elements. 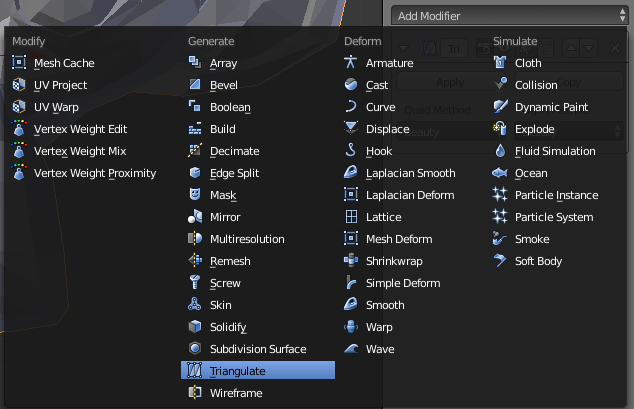 After I post the link of that material in the discussion group BlenderDEV-BR, the user Dalai Felinto (who wrote the book Game Development with Blender), pointed out that Blender has a modifier that triangulates the mesh, preventing the original object be modified. Thanks for the tip! 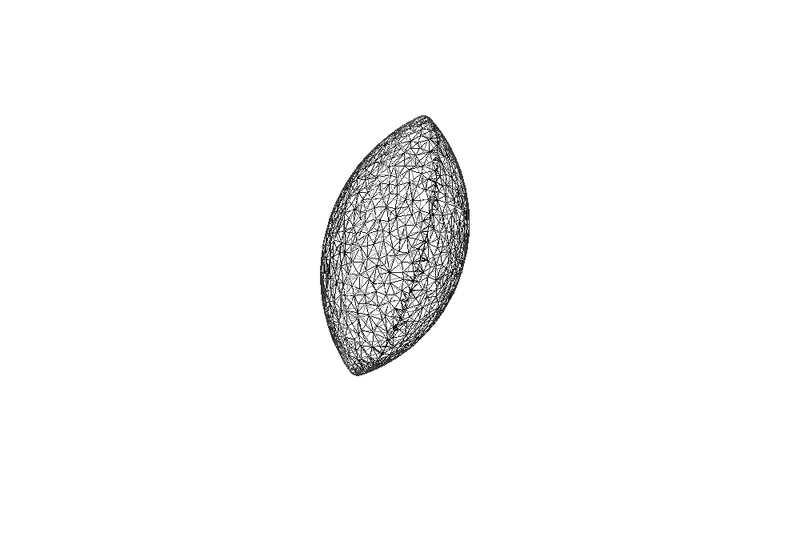 Go to Add Modifier -> Triangulate. However, when I tested the export in default mode I got an error of mesh. To prevent this from happening, take care to keep the "Quad Method" and as the "Ngon Method" both in "Beauty", as in the screenshot above, then yes will work perfectly without errors. I thank my students Dr. Everton Rosa, Marcia Pietrobon and Dr. Rodrigo Dornelles. Also Hermano Peixoto de Oliveira Junior (CTI Renato Archer), thanks to all these people I search this solution and fortunately I found it, so that is now enabling a number of very interesting projects. 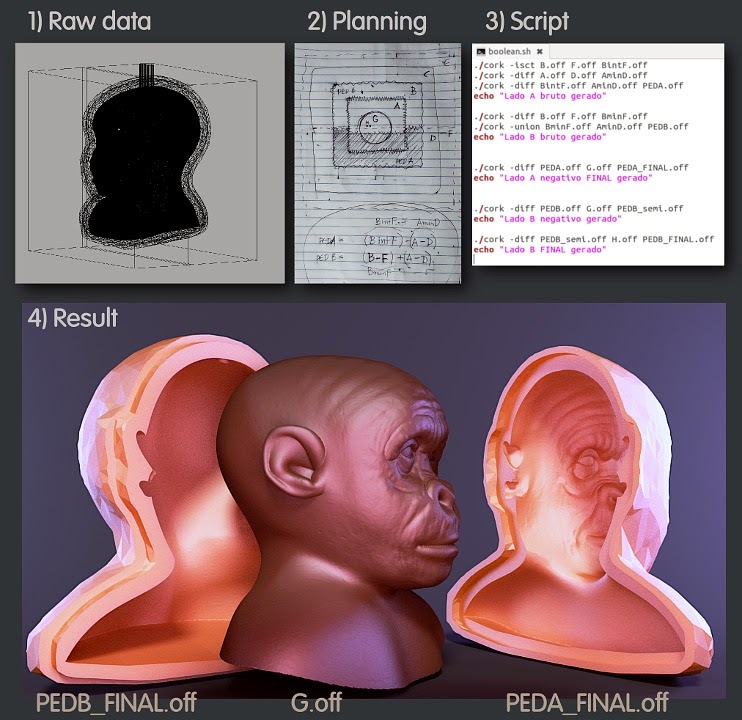 I thank my friend Luís Cláudio Sampaio Marques (patola) which has supported this project sedendo its expertise in 3D printing to validate the projections and even an impression, that will materialize the results. I thank the creator of Cork, Mr. Gilbert Bernstein for the excellent tool and the attention he has given the experiences that I have done. I thank the creator of CloudCompare, Daniel Girardeau-Montaut, which besides giving me indirectly hint of Cork, also implemented a plugin for it to be used directly in application developed by him! A big hug for all and to you, dear reader. See you next time!